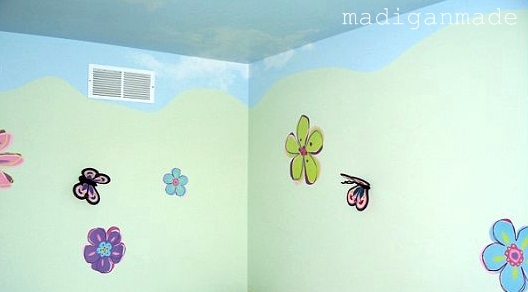 Madigan waited… to redecorate this room. I wrote part of this post over a year and a half ago, but hesitated to share it. This is a post about decorating one of our spare bedrooms. But this post is soooo much more than that. It is personal, too. I typically avoid talking about this subject with anyone except my husband and close friends or family. I’m not sure where to begin, so I will start with talking about this room. When we moved into our little home, this bedroom was every little girl’s envy. A scene of rolling green hills and flowers and butterflies covered the walls. But as a newlywed couple with no children, we immediately wanted to neutralize the space. We painted the room a soft buttery cream. In the back of my mind, I thought that this would be a perfect color for a nursery some day. We put my old Ikea futon in the room for any overnight guests. The room slowly received various cast off tables and lamps from other rooms. I did put up some roman shades that matched the wall color. Pretty, right? I had hoped that ‘someday’ came already. For the past 2.5+ years, hubs and I having been trying to conceive. After some time trying, my husband and I went to specialists. We’ve seen various doctors off and on. While we are grateful for what we do have, we always hope that we will be blessed with a child someday. I feel like our faith is being tested and it is hard to be patient. But as I told you in my one word resolution for 2012, I am trying to live for today. And it makes me sad to look at this bedroom as it sits empty and waits in limbo, similar to our life… that feels like it is on ‘pause.’ And personally, I can’t sit in limbo anymore. So, in the spirit of ‘living for today’, I am updating this room a little. It may not hold a baby right now, but I want this room to be another space in our home that we can actively use and enjoy. This room update is not about giving up. It is more about living for today. I will always have hope and anticipate miracles for this space. And making our environment more inviting and special will only help to fuel that dream. I want to thank you for listening to our very personal story about this room. It was not easy to share the fact that we have struggled with infertility. But I feel I’m ready to be a little more open about this issue. I also I wanted you to know the background about this bedroom and what these changes mean to me. So, stay tuned ﻿as I will be sharing some new projects for this special space.